A ‘MNFD’ Tribute to Steve Jobs. A picture worth a thousand words. Orgin unknow as I pulled it off FB. 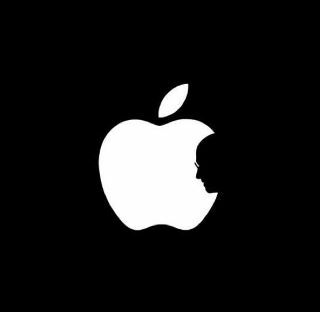 It is a sad day today as the news and images of Steve Job’s death fill all of our communication channels. TV, radio, digital, social media. We cannot deny the influence he has had on all of us whether we even really know it or not. If we don’t know it, perhaps it’s because often we don’t sit back and dissect influence until something happens to a person. People like Henry Ford, or Aurthur C. Nielsen Jr. who also died yesterday. If you have ever heard of the Nielsen ratings by which most advertisers and networks live and breathe their media investmenets, he is the pioneer of creating measurement on TV. You can think about other people like Howard Shultz, the founder of Starbucks, who has managed to convince the world that it makes sense to buy a $4.00 cup of coffee, who has not yet passed (no jinx here just admiration) who have so dramatically altered our society that you don’t even think about it. Both personally and professionally, I admire Steve Jobs, although in some ways in this case it is hard to disconnect the two. Steve Jobs from his humble beginnings managed to become what some people are comparing to the great inventors of our time, Einstein, Henry Ford, etc.. Working in media/entertainment/advertising, I have long followed Steve Jobs as he time after time defied all rational thought when he innovated to convince us of what we need as consumers. Everything from how we consume content like music, TV, Film Digital (itunes), to how we access the content (computers, iphone, ipads), to where we access content (everywhere), to how to present the package (apple stores) to how we appreciate marketing (widely anticipated conferences to launch new products, what?) and beautiful design. Amazing. I experienced some of his innovation personally when in Season 8 of American Idol we did a deal with Apple and iTunes to integrate both the iphone and Apple products as well as iTunes into the show. Doing the deal, was like putting two 800 pound gorillas in a cage and asking them to duke it out. After literally negotiating around the clock and finally making our agreement, is was a special moment to watch Ryan Seacrest make that first announcement about allowing viewers and fans to access the content from the show through iTunes. With advertiser integration in live shows also comes stress. One of the most stressful times in my job was when we would be live and Ryan or the judges would go off-script. In one particular episode they decided to do this with both Coke and Apple. It was a disaster. Coke and Apple were furious…Fox was furious and I was too, but the deed had been done. We kept hearing the Steven Jobs was irritated with the hiccup and we needed to make sure that wouldn’t happen again. First I couldn’t have been more relieved that at least I would have an answer for everyone and second, I couldn’t even really be mad for not knowing about it, because I was so secretly impressed that Ryan had Steve Jobs on speed dial. It was just at arms length, but as KSP and I woke up this morning and managed to convince Q that for 10 minutes mama and dada wanted to watch the news instead of listening to Top 40 music on DirecTV, we looked at the moving image of Steve Jobs on Apple’s website and Scott said to me, 56, he was only 56, only 18 years older than me. And that is how fast things can change. With a phone call, with a doctor’s appointment, with moment. Steve Jobs is an inspiration and even though as everyone seems to point out, he wasn’t perfect, who is? He is so very clearly human as he demonstrated in his Commencement Speech at Stanford University. I am including a link for those who haven’t seen it, it is great to watch. Today is a hard day to say it’s ‘mynewfavoriteday’ as the world is a different place today, as I type on my Macbook Air and charge my iPhone while my iPad sits not far away loaded with apps for both me and the babies. Yes, it is a different place. But then I see all of these things and think what an amazing time to be alive. To have experienced all of these things. What an amazing gift we have to be alive. To be able to wake up next to ones we love in the morning or to hold those we love in our arms. I wish you a ‘newfavoriteday’ as we all move forward in what will undoubtedly be a new era of innovation, media and marketing with a reminder of a beautiful gift, you can fill your lungs with air and just be grateful for being here. Rest in Peace, Steve Jobs. ← Whoo Hoo, ‘mnfd’ has been nominated on Parents.com! Please, please vote! Awesome. My heart feels so sad. What a true innovator and he had a huge impact on Amy career in technology. I hope to make some difference and generate money for research and development for cancer. Its such a horrible disease. RIP Steve.